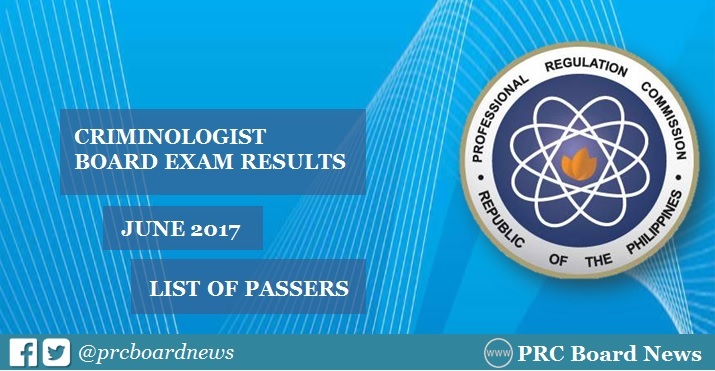 The Professional Regulation Commission (PRC) and the Board of Criminology released official results of June 2017 Criminologist board exam also known as Criminologist Licensure Exam (CLE) in twelve (12) working days after the exam, or on Friday, June 30. The alphabetical list of passers, top 10 (topnotchers), top performing school and performance of schools are available on this page. As announced, 5,202 out of 20,819 (24.99%) passed the exams. PRC administered the board exam on June 11, 12 and 13 (Sunday to Tuesday) in Manila, Zamboanga and all regional offices nationwide. From July 13, registration for the issuance of Professional Identification Card (ID) and Certificate of Registration will be done on-line. Visit the official website of PRC (www.prc.gov.ph) and follow instructions for initial registration. "The successful examinees should personally register and sign in the Roster of Registered Professionals." The June 2017 Criminologist board exam covered the following subjects: criminal jurisprudence, procedure and evidence and law enfocement administration (June 11), criminalistics, crime detection and investigation (June 12); and sociology of crimes and ethics and correctional administration (June 13). According to PRC Resolution No. 2016-1019, which deals with the 'Schedule of Licensure Examination for Year 2017', the target release of Criminologist board exam results is on Friday, June 30 or in 12 working days after the exam. In April 2016 exams, PRC announced results in eleven (11) working days. A total of 3,928 out of 16,435 (23.90%) passed the tests. In April 2015 exams, results were out in thirteen (13) working days. PRC named 4,337 out of 14,696 (29.51%) who have hurdled the series of exams. We advise examinees to monitor release of results from June 27 to 30 or in 9 to 12 working days. In the October and April 2016 exams, University of the Cordilleras (UC) dominated the CLE, 95.16% and 98.13%, respectively. Lipa City Colleges and University of Baguio ranked second and third in the April 2016 CLE. Meanwhile, King's College of the Philippines Inc. - Benguet, Tarlac State University (TSU), Ifugao State University (ISU) and Data Center College of the Philippines - Laoag City are among the top shools in the October 2016 exams. PRC Board News will update this page immediately for the list of passers, topnotchers and performance of schools once results are released online.